Lisa visits Elisabeth Grenholm, owner of Hägra farm, who keep a small flock of Jämtland sheep and learns about shift grazing. Hägra farm is beautifully located. Two old wooden houses sit on fields where sheep and horses graze. A river flows behind it. The owner of the farm, Elisabeth Grenholm, cannot receive us when we visit. Instead, her mum Elsa invites us in for a cup of tea and some home made Swedish cinnamon rolls. Elsa explains softly how her daughter has only seven Jämtlands sheep. 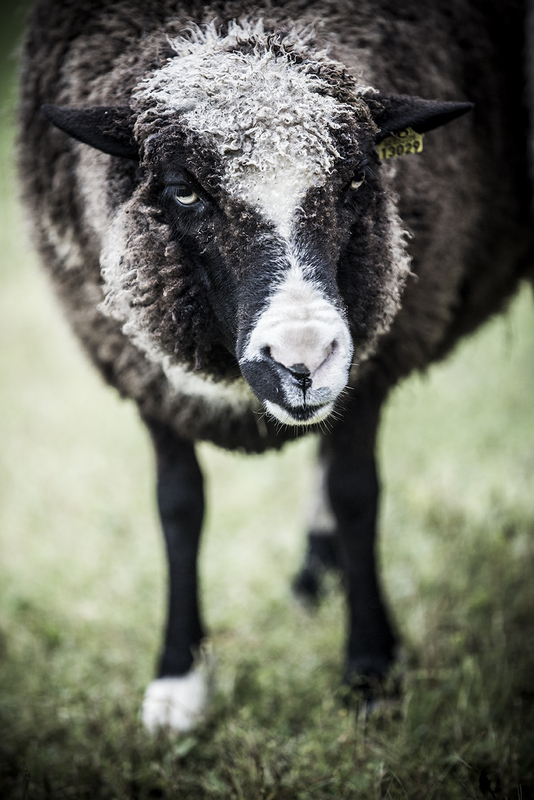 Her animals have been tested for Maedi-Visna (MV), a viral disease that affects sheep. The farm has M-3 status, the highest rating attainable, meaning all her sheep are free from MV. We walk out in the rain to greet the sheep. They are grazing in the pasture, separated from the horses. Elsa explains that the sheep and horses “shift-graze”, meaning they can share the same pasture in turns. The sheep are happy to eat the grass close to the horses poop, meaning more of the grass is used and can still be fertilised. Her husband joins us and explains how the couple also take care of wounded wild birds. If the local police are contacted when a wild bird has been wounded, they will bring the bird to Elsa and her husband. They have a long experience of working with birds and take care of them until they are ready to be set free again. We thank Elsa for her time, and the wonderful cinnamon rolls, to continue our journey. A New Sweden is a sustainable luxury label that takes a hyperlocal approach to materials and manufacture. All orders on anewsweden.com are shipped complimentary with DHL's carbon neutral GoGreen service. If for any reason you are unsatisfied with your garment, return it to us in a sellable condition within 14 days and we will refund your money. By submitting your email address to us you consent to us contacting you about A NEW SWEDEN. Please confirm your subscription in the email sent to your address. We couldn't register your email address. Try it again?